Months of intense training – including coming to school before assembly to train – boiled down to 2 days of finals for Raffles Swim. As Madeline Quek put it, the trainings were “tiring physically, but worth it”. Looking at the results now, it is clear that it was indeed worth it – with the A division girls clinching 1st overall and A division boys being awarded first runners up. It was a close fight and tensions were rising with RI’s rival schools ACS(I) and ACJC proving to be strong competitors. The coach of RI swim Mr Lim Yao Xiang commented early on that there was no clear indication on which school would emerge victorious, and that it might even “boil down to the last relay.” Despite having “no national swimmers on the team”, the stellar achievements stood as testament to the sheer grit and hard work of our swimmers. The girl’s segment of the competition began with our girls team placing in the top 3 for almost all races – a result consistent with what we have seen in previous years. For the 50m Freestyle race, tensions rose as Song Ai Vee went neck and neck with Annis Loy from Temasek Junior College. The two eventually tied for second place after an intense fight, with Nicole Ong Ting Zhi racing in a close third just milliseconds after. Nicole Ong also bagged a bronze medal for the 50m backstroke. 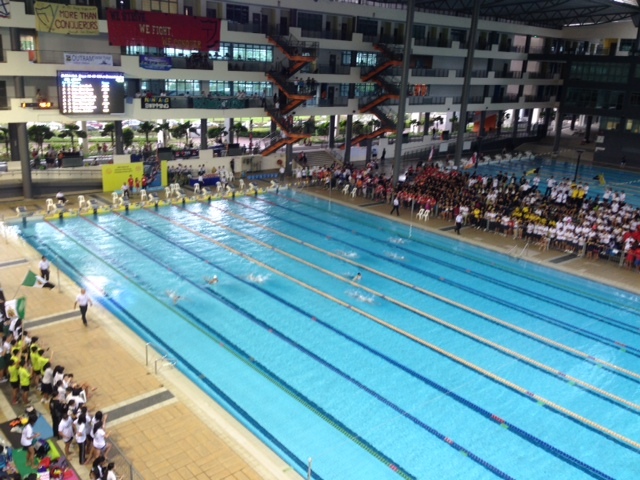 Similar victories were seen in the 200m freestyle where Dayna Ang and Christiane Tan placed 1st and 2nd respectively. 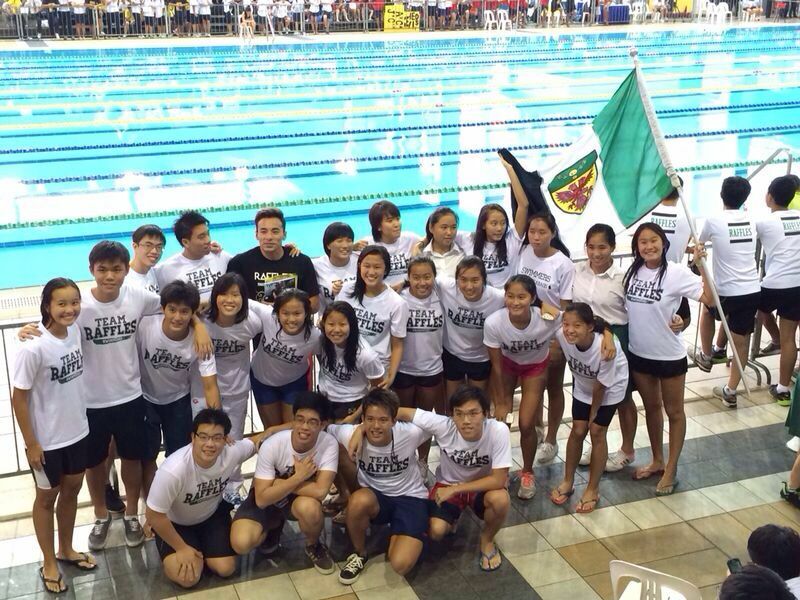 Richelle Ang also made a podium finish – clinching third place in the 200m individual medley. Rachel Lee put up a strong showing with two wins: 3rd in the 50m breaststroke as well as in the 100m breaststroke. Madeline Quek was another serial medallist with her placing of 2nd in the 50m backstroke and butterfly. Over at the 200m breaststroke, Grace Tan placed 3rd and Gayle Tan placed a commendable 2nd despite facing strong competitors from ACJC. The 400m freestyle elicited cheers from the Rafflesian crowd as Teo Jing Wen, Kimberly Yeo and Chloe Tan all placed 1st, 2nd and 3rd respectively, sweeping the awards for that category. A breathtaking dash to the finish in the 200m breaststroke event led to Samantha Yeo setting a new competition record, clocking in at 2.34.17 – almost 3 whole seconds faster than the previous record. Samantha again clinched first position for the Girls 100m Breaststroke, with a record breaking timing of 1:11.65, 1.06 seconds faster than the previous record. Unfortunately, the result was subsequently disqualified due to her doing a double fly kick. Despite that, spirits soared as the much-anticipated 4x50m Freestyle Relay saw our girls relay team (Samantha Yeo, Teo, Jing Wen Shan, Madeline Quek and Song Ai Vee) bring a roaring victory to RI by coming in first with a timing of 1:50.44 9 in the 4×50 Meter Freestyle relay. 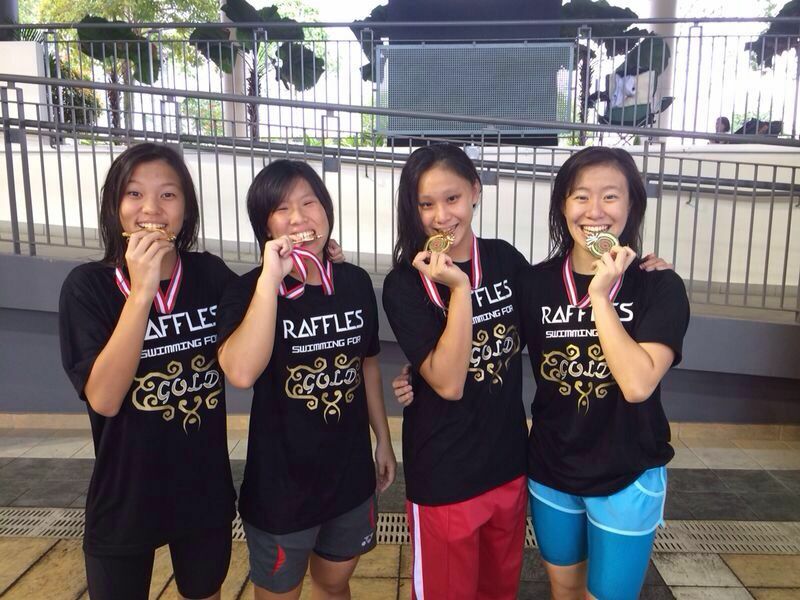 The 4x50m Medley relay had a similar showing, with the girls securing the overall gold medal for our team. In the 200m freestyle race – a race primarily between RI, ACSI and ACJC, Andy Lo was able to clinch the gold medal, beating ACSI by 1.23 seconds. The other 2 RI swimmers,, Aloysius Tan and Bryan Tan came in 4th and 5th respectively. Other notable races include the 100m breaststroke where Alexander Tseng Wei Chen, Teo Cheng Quan Edmund and Lee Teck Fang Kenneth came in 2nd, 3rd and 4th respectively. Despite the stiff competition for the 100m backstroke, where a new record was set by one of our arch competitors, Andy Lo and Joshua Koh fought to clinch the 2nd and 5th respectively. Joshua Koh also took home a bronze for the 200m Backstroke. Quan Ren Barry Koh fought hard to finish 5th in the 200m butterfly race. In the first and second laps, he was placed 6th with timings of 1:07.18, 1:44.4 respectively. However, at the last lap, after putting up a valiant fight, he finally emerged 5th, with the timing of 2 2:23.54. The 4x50m freestyle and medley relays were both highly anticipated races. For the freestyle race, our team fought hard but ACSI took the lead and clinched gold by a narrow 3-second difference. Ultimately the Raffles Swim team came in second for both races, making the school extremely proud. The team consisted of Bradley Samual, Windley, Teo Chang Quan Edmund, Lee Teck Fang Kenneth and Tan Xuan Fu. The fight to the finish is never easy, just as the race to the finals was tough for the Raffles Swim team. However, as A-division girls captain Kathleen Leong said: We really hope that the raffles legacy will be able to continue for many years to come and that everybody will be able to swim for pride, glory, honour – Raffles!